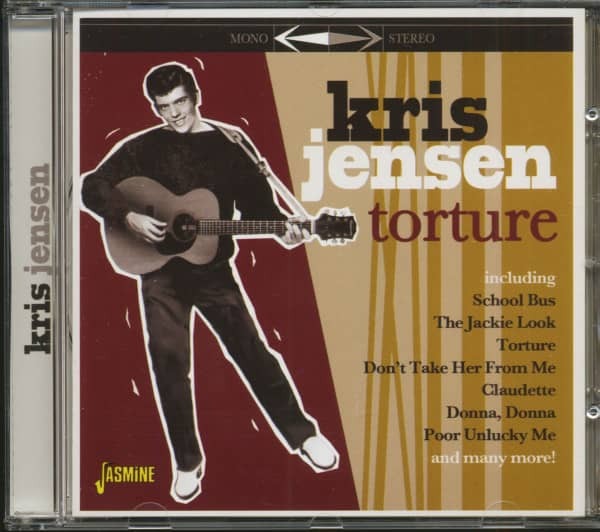 Kris Jensen is known predominantly for his 1962 hit 'Torture', a song which had originally been custom-written by Felice & Boudleaux Bryant for the Everly Brothers. However, Jensen had been recording since 1959, and his early R&R/teener releases have long been sought-after collectors' items. This unique compilation features everything that he recorded between 1959-62, variously for the Colpix, Leader, Kapp and Hickory labels. Includes hard-to-find regional hits like 'Bonnie Baby', 'School Bus', 'The Jackie Look' (the latter, something of a cult 45), 'Three Vanilla, Two Chocolate, One Pistachio, Ice Cream Cone', 'Don't Take Her From Me', 'Big As I Can Dream' and 'Donna, Donna'. 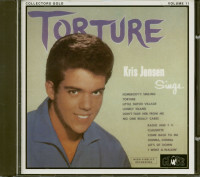 Also includes his debut LP, 'Torture', titled after his breakthrough hit. Most of these sides were penned by Nashville's finest songwriters, e.g. the (aforementioned) Bryants, John D. Loudermilk, Bob Montgomery, Roy Orbison & Joe Melson, and Earl Sinks. Several of Jensen's early, 1960-61 sides, have never previously appeared on CD. Kris Jensen was born in New Haven, Connecticutt, U.S.A. on April 4th. 1942. He is of Danish/ Finnish descent. He has two younger brothers and a sister. His musical influence was acquired by listening to his fathers' extensive collection of Burl Ives, Chet Atkins and other folk and country records. He started playing guitar when he was fifteen and studied chords for a short time before developing a love for pop-country music through the influence of Elvis Presley. He played at school dances etc. until 1957 when his father took him to Dennise Norwood (the composer of "Garden Of Eden" etc.) in Fort Lauderdale, Florida to study and develop his own style of pop-country singing. He graduated from Fort Lauderdale High School in June 1960. Two weeks later, whilst on vacation with his family in Tennessee, Dennise Norwood made an appointment for him with Wesley Rose (President of Hickory Records Inc. and the Acuff-Rose Publishing complex in Nashville). Wesley Rose got him a contract with LEADER records (a subsidary of KAPP) in New York and Kris' first session was cut on August 3rd. 1960. (Leader L-808 "School Bus" c/w "Perfect Lover"). One more disc was released on LEADER and he then moved to KAPP for three single issues. He joined "HICKORY" records in 1962 and his first single "Torture" c/w "Let's Sit Down" Hickory 45-1173 was a big hit for him in the Autumn of that year. The recordings on this album cover his "HICKORY" era which lasted until 1965, and include some previously unissued titles. They highlight the image of the "all American boy", with their strict adherence to the teen idol status created by the likes of Fabian, Frankie Avalon, Bobby Rydell etc. From teen ballad to up-tempo vocals they all retain the "clean" sound of an era now passed into history. Many of the songs being provided by the Acuff-Rose staff writers of that time - John D. Loudermilk, the Bryants and Roy Orbison & Joe Melson. It was during his time with HICKORY that Kris' made his first visits overseas and this included an appearance in London on the "THANK YOUR LUCKY STARS" TV programme singing "Donna, Donna" in 1963. After leaving "Hickory" he moved to the West Coast area of the U.S.A. and recorded for "White Whale" and "A&N" in Los Angeles. In 1973 he was working as West Coast promotions manager for Snuff Garrett Enterprises but nothing is known of his current activities. Customer evaluation for "Torture (CD)"